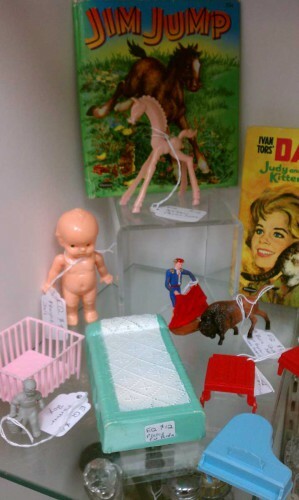 We have a shelf in one of the glass cases at Exit 55 Antiques (Fergus Falls, MN) and recently put in a whole bunch of vintage dollhouse furniture (along with a few dolls, some vintage children’s books, etc.) 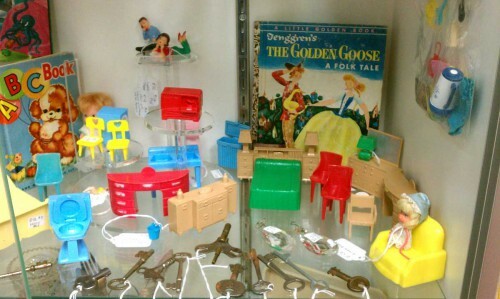 The furniture was made by Marx, Superior, Multiple Products Company and others. My favorites are the two-piece bed set, the little green lamp, and the little console (featuring a TV and a turntable). Among the “etc.” are a pair of vintage cake toppers. One is a bull and bullfighter; the other, a pair of teenagers talking on telephones. Some pieces have already sold. If you are interested, please contact us. Or call the shop directly at between 10 am and 5 pm (Central time). We will ship! 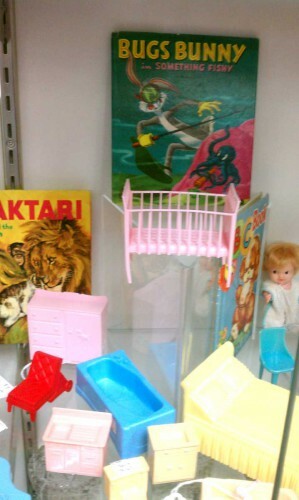 One Response to "Vintage Doll House Furniture"